Kynetics has built a vanilla image of Android Nougat supporting the Toradex Colibri i.MX7D SOM and the Iris carrier board. 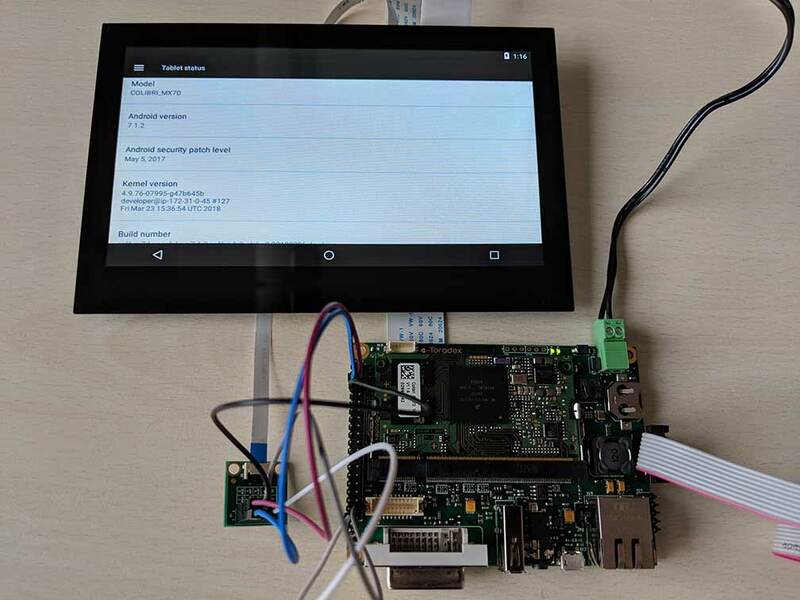 It is pretty exciting to share with all of you this work we have done so far and to give you the chance to enjoy Android on this embedded system. The Iris board has a DVI port: it was tested up to a resolution of 1024x768. We've created a video that walks you through the steps. See farther down this page for information about things like how to put the board in recovery mode, etc. Kynetics Android for Toradex binaries package, can be downloaded from here. imx_usb from Boundary Devices to load u-boot in device RAM. Android platform tools installed on the host computer. You can download the archive here. Note: we need this archive to acquire the fastboot binary. Alternatively, you can install fastboot via a package manager. In this guide, we will use Ubuntu's package manager. libusb userspace programming library and development tools. Alternatively, if you decided to download the platform-tools archive from Google, you will need to update your PATH environment variable. There are a number of ways to address this, not covered in this guide. Ensure that libusb is installed. You can compile from source, here. Or, alternatively you can download via package manager. In the imx_usb_loader-master archive that you downloaded and extracted earlier, do a make in the root of the folder. This should succeed without error, assuming you have libusb properly installed as noted in 2. You should now see the imx_usb binary in the same folder upon completion of the make. Connect to the serial port using the PINs on the Iris board. For more information about connecting to the Iris serial port, see here. Connect also the micro USB port of the board to the host computer. Enter in recovery mode. For information how to enter in recovery mode see here. $imx_usb /path/to/u-boot.imx as root if necessary. u-boot.imx is in the Kynetics Android for Toradex package folder. => res (this will restart the board. If the board does not restart, do a power cycle). Android should start. If this is the first time the Toradex capacitive display is used, it is necessary to configure the touchscreen. The Atmel touch controller needs to be flashed with a configuration file in order to have a working touchscreen. The controller configuration is a one time task and it is independent from the OS, so if you have already flashed the configuration on the chip, you can skip this point. Please refer here for more info. To flash the configuration use the mxt-app binary and the LTCTP070-3-GG_mXT1066T2_tdx_20170911.xcfg provided in the Kynetics Android for Toradex package (the versions provided by Toradex won't work on Android 7). The source code of mxt-app is available here. After reboot, the touchscreen will work and you are ready to enjoy Android on the i.MX7 Colibri System.